There are two ingredients which I have limited success with when baking – yeast and gelatine. When using yeast I simply don’t have the patience for the all the waiting around and gelatine is just very hit and miss with me especially if I’m adding it to a cold mixture. I had decided to make a raspberry cheesecake last week and went for the more traditional recipe which included gelatine. I spent a small fortune on the ingredients and set about creating my masterpiece. Well not quite the masterpiece I had hoped for – I ended up with a bowl of stringy, gelatinous goo. Straight in the bin it went. A couple of days later my daughter had a day off school so I thought I’d use one of my tried and tested ‘cheat’ recipes for a foolproof baking session with her. Instead of the gelatine we used flavoured jelly cubes and it was a resounding success. So much easier and more flavourful too. 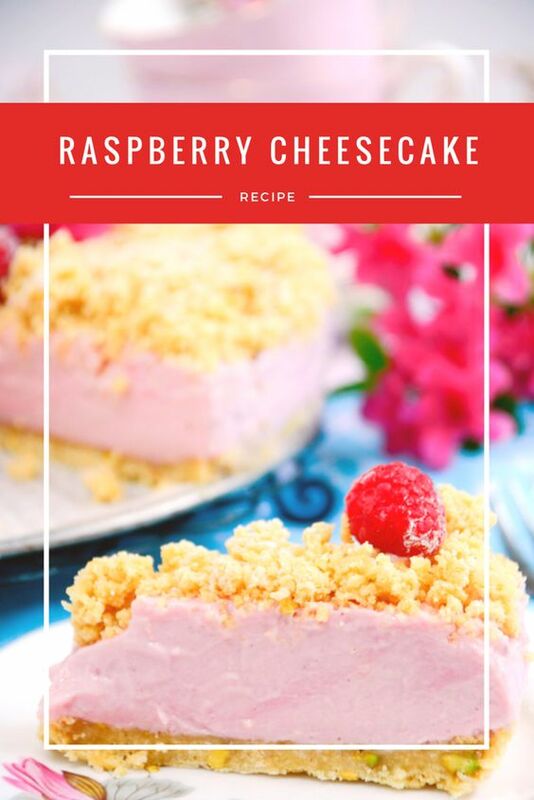 So this easy no bake raspberry cheesecake might not be very authentic but it is very, very tasty. This is such an easy no bake cheesecake - perfect for Spring and Summer dining. Combine the crushed biscuits, praline and melted butter together. Press half the mixture into a greased 23cm springform cake tin, setting aside the other half of the mixture. Add the jelly cubes and boiling water to a small pan and heat gently until all the jelly has melted. Set aside to cool. Add the cream cheese, condensed milk and lemon juice to a bowl and beat until well combined. Add the cooled jelly and raspberry puree and mix thoroughly. Pour over the crust and chill until set. Press the remaining crumb mixture evenly on top of the set filling and refrigerate. The crushed praline which I use in the crumb is not absolutely necessary but it does give a nice crunch. I make up a batch and keep it in a tupperware for when I'm baking. It keeps for months. If you want to reduce the cost or the calories then only make half the crumb mixture and don't add any to the top of the cheesecake. When my son came home from school I heard my daughter telling him that she’d made a cheesecake. “You’ve got to try some – it’ll blow your mind” she said. This entry was posted in Desserts and tagged cheesecake, Desserts on May 8, 2017 by Angela Darroch. Autumn is here and what’s not to love. Lovely sunny days, crisp fresh evenings, the gorgeous colours all around us and this rich, warming Burgundy chicken casserole served with a dollop of buttery mash and a glass of red wine. This rather delectable Chicken Casserole ticks all the boxes for a warm and comforting Autumnal meal. I could go on and on about the gorgeous aroma, the delicious sauce and the juicy, fall off the bone chicken but it’s probably much easier to just say that it’s been a firm family favourite for at least the past 20 years and never fails to please. Give it a go – you won’t be disappointed. A simple and delectable chicken casserole - perfect heart warming food. Heat the olive oil in a pan and brown the chicken, skin side down until nice and crisp. Arrange the chicken, skin side up in an oven proof baking dish. Sprinkle the chicken with the salt and smoked paprika. While the chicken is in the oven, prepare the sauce by adding the onion and red pepper to the pan drippings and sauté until soft. Add the mushrooms, thyme and a little extra oil if necessary and stir fry until soft. Sprinkle in the flour and stir through to mix well. Add the chicken stock, red wine, tomato paste, salt, sugar and Worcestershire sauce and stir until thickened. When the chicken is done, uncover and pour off any excess fat. Pour the sauce over and add the onions to the dish. Cover and bake for a further 45 mins. This entry was posted in Main Meals on October 4, 2016 by Angela Darroch. It was a very easy cake to make and went down a treat with our afternoon tea. It definitely gets better after a day or two so keep that in mind if you are going to make it. A simple and delicious carrot cake for a perfect tea time treat. Grease and line 2 x 20cm x 4cm sandwich tins. In a large bowl, mix the carrots, pistachios and lime zest and leave to the side. Into another bowl, sift the flour, baking powder and spices into a bowl. Add the eggs, sugar and oil and whisk well. Fold the carrot mixture into the flour and egg mixture and mix well until just combined. Divide the mixture evenly into the two sandwich tins and bake in the middle of the oven for 30 - 35 mins. Test with a skewer and once done, leave to rest for 10 minutes before removing from the tins. Remove the cakes from the tins and leave until completely cool on a wire rack. Add the cream cheese and whisk until well combined. Add the icing sugar and lime juice and whisk until well combined and nice and thick. Add cream cheese frosting to the top of one cake and sandwich the remaining cake on top. Add more cream cheese to the top layer and a thin layer all around the sides. Decorate (I made some pistachio praline which I then blitzed and sprinkled on the top). This entry was posted in Baking on June 22, 2016 by Angela Darroch. I definitely go through phases with my cocktails. At the moment my absolute favourite has to be the Lemon Drop Martini. Slightly sour, slightly sweet and very, very drinkable. I normally use Absolut Citron Vodka but if I don’t have any then normal Vodka works just as well – just add the lemon zest to the cocktail shaker with the other ingredients to extract some of those lovely lemon oils for added flavour. Add fresh ice and shake vigorously. Strain into a chilled glass and decorate with a twist of lemon zest. To make your own sugar syrup - add 1 cup sugar and 1 cup water to a pan. Bring to the boil, stirring all the time to dissolve the sugar. As soon as the sugar has dissolved, remove from the heat and leave to cool. Store in the refrigerator. I’m looking at my watch as I write this to see if it is cocktail hour yet – not quite but I can tell you that in about half an hour or so I’ll be sipping on a delicious Lemon Drop Martini. This entry was posted in Cocktails on June 11, 2016 by Angela Darroch. So tomorrow is Shrove Tuesday and the kids have placed their order for pancakes. For breakfast they want the thick, spongy Scotch pancakes with bacon and maple syrup and after school they want these thin pancakes (which I call crêpes) with Nutella. I’m not sure they fully understand the meaning of Pancake Day and that Lent follows soon after. I wonder how long they would last if they had to give up something important for the next six weeks? I might just test them out for fun. These pancakes are so quick and easy and yes I know it’s easy to buy the mixture from the supermarkets but ‘made from scratch’ tastes so much better and the kids love getting involved. I haven’t had one stuck to my ceiling yet and that’s not from lack of trying by the kids. Enjoy with lemon, sugar and cinnamon, Nutella, caramel sauce, fresh fruit and cream – basically anything you want really. Add the two eggs to the dry mixture and beat well with a balloon whisk. Add the milk and combine well with the whisk. Leave the mixture to rest in the refrigerator for 30 minutes. Heat a 20cm non-stick pan until hot and pour just enough mixture to thinly coat the bottom of the pan. After about 1 - 2 minutes the edge of the pancake will be nice and crispy and the bottom of the pancake nicely browned. Flip the pancake and cook for another 1 - 2 minutes on the other side. Serve warm with fresh lemon juice and sugar and cinnamon. This entry was posted in Breakfast/Brunch, Desserts on February 8, 2016 by Angela Darroch.